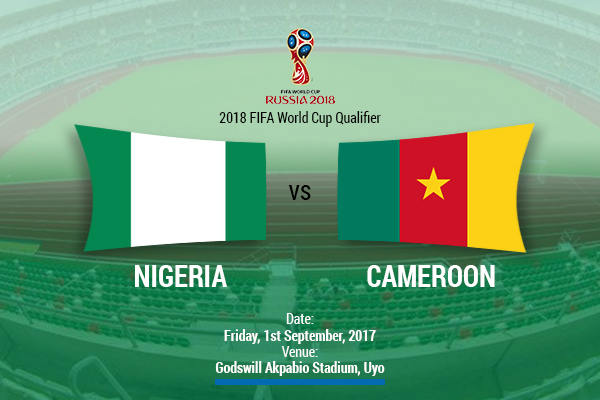 LET’S ADMIT IT: The Super Eagles will be the underdogs when they face eternal rivals, the Indomitable Lions of Cameroun in the first of their crucial 2018 FIFA World Cup qualifying double-header in Uyo on Friday, 1st September, 2017. That (being underdogs) is an unusual scenario when Nigeria are playing at home. Records show that the Eagles are often successful in front of their fans and rarely lose. But one of those rare losses was inflicted by this same Cameroon in the final of the 2000 AFCON when they beat Nigeria in a penalty shoot-out at the National Stadium in Lagos. They’re coming back this year believing they can do it again, this time at the Godswill Akpabio Stadium. History aside, recent form weighs heavily in Cameroon's favour. While the Eagles failed to qualify for this year’s AFCON hosted by Gabon, the Lions went on to win it, tucking in the pocket six highly competitive games in the process. That victory also qualified them for the high profile FIFA Confederations Cup in Russia where they logged a further three games against top quality opposition. Beyond the results, those nine matches put together have helped a young and hitherto tentative new Cameroon team to rediscover themselves and gel as a unit. They will arrive in Uyo oozing with the confidence of African champions. During the same six-month period (January – June) that Cameroon played those nine top grade matches, all that Nigeria had to show was a humbling 2-0 defeat at home to South Africa in a 2019 AFCON qualifier. That loss left a massive bruise on the Eagles’ psyche and they’ve not played another game since then for us to assess how well they’ve recovered. We must admit that it’s not the best preparation for coach Gernot Rohr and his team. With history and recent form in Cameroon's favour, Nigeria must play the game of our lives to emerge victorious on 1 September. Rohr who suffered his first defeat in charge against South Africa must perform a near-miracle in the five days leading to the game which is all he has to get the Eagles ready. He will be hoping that the return of key players such as captain Mikel Obi, Victor Moses and central defender Leon Balogun whose absences were sorely felt against South Africa would restore calm and confidence to the team against Cameroon. Indeed, it is up to the players to show how badly they want to go to the World Cup finals next year. If they want it badly enough, they must wear their hearts on their sleeves and go out for a fight against the Lions. This is a must-win game and they must find a way, any way, to win. It won’t be easy. Meanwhile, there’s also the political angle to the Nigeria-Cameroon clash. Former Confederation of African Football (CAF) president, Issa Hayatou is still smarting from his shock removal from office which Nigeria’s FA president Amaju Pinnick played a key role in orchestrating. And the Cameroon FA (FECAFOOT) are also upset with the new CAF hierarchy for allegedly trying to withdraw from them the hosting rights to the 2019 AFCON. Hayatou and FECAFOOT are eager to exert quick revenge on Nigeria and how they will relish beating the Eagles on their home turf. At the start of these World Cup qualifiers, my preliminary target for the Super Eagles was the full nine points from their first three games. They have collected the six from the opening two games against Zambia and Algeria, so they’re firmly on course. Completing the treble against Cameroon means they can open up a seven point gap on the Lions currently have two points on the group table. A seven-point gap will give the Eagles a healthy cushion going into the return leg in Yaounde on 4 September. That potentially unassailable advantage is worth ‘dying’ for. The last time the Eagles were the underdogs going into an important game such as this on the continent was against Cote d’Ivoire in the quarter-final of the 2013 AFCON in South Africa. On that occasion, late Stephen Keshi’s wards surprised everyone with a 2-1 win and went on to claim the trophy. Despite the odds against them, Gernot Rohr’s Eagles must give us another pleasant surprise against Cameroon on 1st September. Impossible is nothing. A MAJOR distraction that Gernot Rohr will not be dealing with as the Eagles prepare for the Cameroun game is the needless debate on team selection between home-based and foreign-based national team players. Last Sunday at the Sani Abacha Stadium in Kano, the wholly home-based Eagles coached by Salisu Yusuf beat the Squirrels of Benin Republic 2-0 in the return leg of their CHAN qualifier. After surprisingly losing the first leg 1-0 in Cotonou a week earlier, the home Eagles qualified for the finals in Kenya next year 2-1 on aggregate. However, the two matches further exposed the depth to which Nigerian football has fallen. The first leg defeat was the first time tiny Benin Republic would beat “giant” Nigeria in a competitive match. And in Kano, it took a 65th minute penalty save by goalkeeper Ikechukwu Ezenwa to save Nigeria’s blushes. Had Benin scored and the game ended 2-1, Nigeria would have been eliminated from the CHAN tourney, yet again, on the away goals rule. First, it was South Africa whom Nigeria used to beat easily that outclassed our foreign-based Super Eagles 2-0 in Uyo. Now, even little Benin Republic nearly embarrassed our home boys in Kano. The intimidating Nigerian factor of old which scared our opponents to death even before a ball was kicked appears to have disintegrated completely. African teams do not fear the Eagles any more. It will require a lot of hard work and sustained good performance to reclaim that respect. Our work is well and truly cut out. IN CASE you missed the news, let me “break” it again: Complete Sports are the new champions of the Lagos Chapter of the Sports Writers Association of Nigeria (SWAN) Cup sponsored by MerryBet. Last Friday at the Legacy Pitch of the National Stadium, Lagos, our team captained by Julius Ojeagbase defeated Television Continental (TVC) 1-0 in a keenly contested final. Complete Sports thus reclaimed the trophy we last won five years ago in 2012. No, I did not participate in the competition proper because my coach at Liverpool, Jurgen Klopp, did not release me! But I did play for SWAN veterans in a friendly game that preceded the Cup final. Our opponents were FUBS (Friends United By Sport), a WhatsApp forum initiated by journalist-turned-administartor Godwin Enakhena. The SWAN team managed by Jenkins Alumona had Mitchel Obi, Larry Izamoje, Harry Iwuala, Sina Okeleji, Fred Edoreh, Wale Joseph and yours truly among others. But we were clear underdogs against FUBS ex-Super Eagles internationals Peter Rufai, Austin Eguavoen, Jonathan Akpoborie, Edema Fuludu and Mutiu Adepoju. FUBS also paraded Nigeria Football Federation (NFF) chiefs Amaju Pinninck, Shehu Dikko and Chris Green as well as humour merchant Ali Baba. It was a star-studded line-up on both sides. Although FUBS narrowly won the game 1-0 via a “wind-assisted” goal by Mutiu Adepoju, the crowd acknowledged the skills of the SWAN veterans as it took Rufai’s famed agility to stop our goal-bound shots. On a personal note, I thoroughly enjoyed the occasion as it afforded me another opportunity to show off my skills. In fact, Rufai was particularly wary of the danger I could pose because he had seen me in action before and was so impressed that he gave me the nickname, “Skilful.” If Gernot Rohr needs my services against Cameroon, I’m available! If they want it badly enough, they must wear their hearts on their sleeves and go out for a fight against the Lions.